Some Shocking line choice and positioning here! 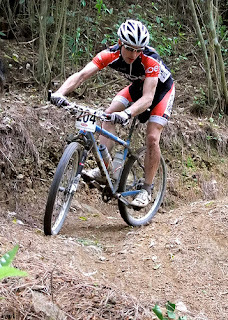 Last Sunday (31/10/10) was Round 4 of the PNP XC series at Belmont Regional Park. This was about a 20km ride from my front door, and without a car the plan was to ride out there in time for sign on at around 9am, with the race start at 10am. I had a number of comments after the race from people thinking me a little odd riding to the race then racing which was quite nice. I did this as well for the 2nd (Wanuimata where I placed 2nd) and 3rd rounds (Mt. Vic where is placed 4th with a cold) which just makes the races a better training session. However for this one I underestimated how cold I would get after the race and even with leg warmers, base layer, jersey, t-shirt and hoodie I was still shivering post race, with the usual comedy Bum-shiver; I can only imagine what my massive rear looks like shivering. I failed at getting to the pre-ride at Belmont the previous week as I had been out the night before (not drinking) which ended with me falling asleep in the bar, probably not the best plan for a 6:30am start... Instead I got out for a 160km road ride with some nice hills. My friend Cameron Wood (henceforth referred to as Cam, largely due to laziness) did however make it out there and gave me low down on the course which was mostly farm tracks with about 8 stream crossings. There were two pieces of singletrack on the course, the start climb and the finishing descent. The quality of these tracks did make up for the lack of technicality on the rest of the course though, even in the dry they were very slippery. So I went to the race with fairly low expectations of the course, but with the dry weather running up to the race everything was riding really nicely. The farm tracks out the back were fast and very bumpy, certainly riding a hardtail required some drifting round the corners to maintain the speed required to be smooth over the rough stuff. The elite field was quite small, but my main competition of Alex Revell was there along with the strongest rider from the last 2 rounds, Ed Crossling. Alex was still on his singlespeed from the SSWC's and was recovering from the lurgy which made me quite hopeful of beating him. Off the start I managed to get into the first corner of the short start loop first and led back over the startline into the start of the race proper, only to be overtaken by Ed and Alex before the start of the singletrack climb. However this suited me as it meant that I could follow lines and measure my pace against theirs having not ridden the course before. The climb seemed to last a horribly long time, although the track (Danzig) was enough fun to keep us entertained. I had an 'On Your Bike' rider on my tail and there was a small gap opening between myself and the leading two. However once we got onto the open farm tracks I started closing the gap on the leading two and caught them on the long descent down to the far end of the lap. From here there was a long climb back up to the top of the course which saw me get dropped again. I lost motivation quite a lot here, and got caught by Tony 'bushlove' Keith over the top before he managed to ride away from me on the long descent after I decided to try and open a gate whilst he just hoped over it. If I'm honest I got quite annoyed by this so I chased hard to try and get back to him. Onto the climb, Tony had managed to catch and usurp Alex for second place who I then caught as he struggled on the steep sections on his singlespeed. When we got onto the drag of Hill rd. Alex was on my wheel, and Tony was about 250m ahead, with Ed quite a ways in front having seemingly decided to drop the hammer a bit. With Alex tucked on my wheel I rode hard up to Tony and rode away from them both, steadily closing the gap to Ed until we were about 300m apart before the final singletrack. Not knowing where the entrance to this track was I nearly missed it, but instead crashed trying to turn into it at full pace very late. Not a good start. However I managed to make it down, and got onto the little finishing loop with Ed in sight. I rode as hard as I could to get up to him, but never quite got in contact once he realised I was there. Coming in 2nd that close to Ed was a nice surprise, having been 10mins off him at Wainui 5 weeks previously, either I was stronger or Ed wasn't trying so hard!